So, as first in a series, here is Stuart Reardon, professional rugby player, English fitness model, and outspoken gay rights...um, outspeaker. Holy chestplate, Batman! Stuart Reardon. Image from listal.com. He's on the October 2013 cover of Gay Times under the absolutely fabulous tagline, "Scrum and Get It." Here's an excerpt. He loves the gays, hates Russia’s treatment of us and works with underprivileged kids. 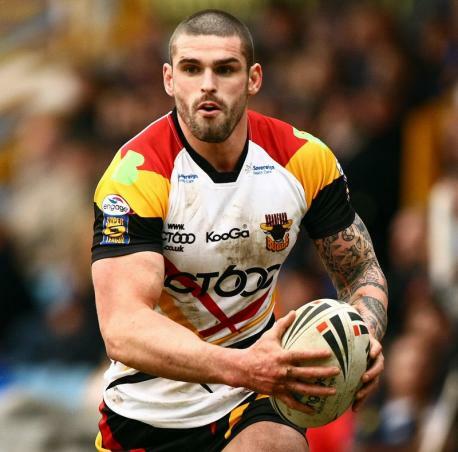 Rugby ace Stuart Reardon is like the Mother Theresa of Warrington - only with thighs that could crack a coconut under his wimple. Glad they didn't dress him in a wimple. Image from newnownext.com. Oh, you want more, you say? All right. Hey, Stuart! How about a roll in the hay? Image from listal.com. Feeling inspired yet? Image from tumblr.com. Here's one of him playing rugby. He plays for the French team AS Carcassonne. Image from thetelegraphandargus.co.uk. One more for your grandma. Image from myportiswaspsays.com.